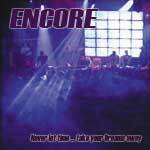 It all started in the mid-nineties with "LiveAct Encore". 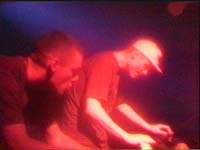 The techno-hype was huge at this time and we were all together inside an "express train" to another planet or something :-). 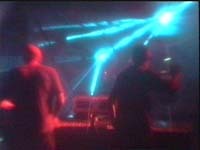 There were lots of big techno parties and a huge enthusiasm for this "new" music. The tracks were fast, hard, rhythmic, melodic, spherical, and loaded with an incredible energy, as I had never experienced before. I was enthusiastic immediately, and of course was a "fat bass drum" and this "new" filter synths an integral part of each track. Considering the basic sounds and the song structure the whole thing was really something completely new. We were dancing sweaty until complete exhaustion and at least until daylight. 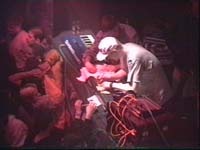 There were usually several DJs every night, which were interrupted by some Livacts. 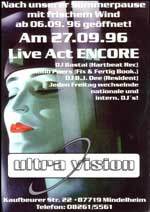 We were one of these liveacts, the "LiveAct Encore". 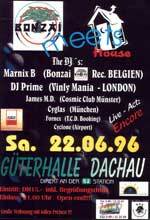 Although a "small" LiveAct, we had some very popular song and we were booked for several years about 2 times a month in all kinds of events across Germany, Austria, Switzerland, etc.. 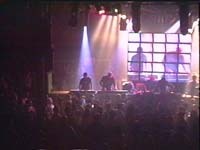 Especially in Germany and Switzerland, we had some really big performances in front of thousands of people per evening. At this point a greeting to all people who have seen us playing live somewhere or know us from some good old vinyl records :-). 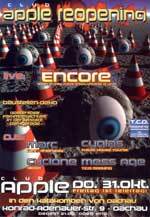 The song "Encore" even made it to the D-Trance Compilation by Gary D., for us at that time a sort of knighthood and of course a great honor to be on the same compilation with tracks like "Rodd-Y-Ler Lifesigns" etc.I do not need to mention, that we didn´t earn very much money with our liveact, but we did it with heart and soul and I really can say in retrospect: "... a damn cool time!" :-). 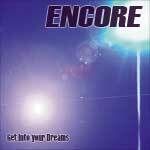 Maxi CD "LiveAct Encore - Never let time take your dreams away"
Maxi CD "LiveAct Encore - The Dreams of Unity"
This CD is a remake of our old liveact classic "Reunion", which we had played at the very beginning of the live performance in earlier days. Clearly one of the best melodies of LiveAct Encore ! The original version of "Reunion" is also included on the CD, like the 2 new mixes, which I think are at least as good as the original. "The Dreams of Unity" means: Don`t stop dreaming about many people being happily together. This is in my opinion a very strong message of that time ! 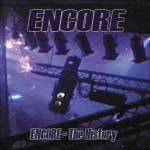 Maxi CD "LiveAct Encore - Encore The History"
The song "Encore" was the origin of the name of the liveact. This song was the reason to be able to play in front of large audiences and definitely our most popular track ! We always played this track at the end of our live performances and the people loved it and that created a very special athmosphere again and again. The moments when we played this song in front of thousands of cheering people with us live on stage, i will never forget ! This song with its unique piano melody made everything possible for us, especially in the beginning of our liveact-years ! The CD contains 3 different versions of the song, including the very first original and very rare version of our early gigs ! 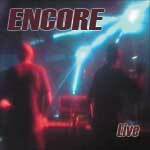 Maxi-CD "LiveAct Encore - Live"
The title "Live" we always played as the opener of our live shows. It is fast, melodic and great to start in front of big crowds ! It is also one of our most popular tracks. The tracks "Welcome to my decision" and "And free", other highlights also very melodic are included as well on the CD. 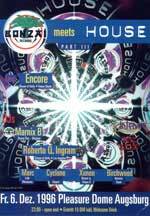 Maxi Cd "LiveAct Encore - Melting House"
The tracks on this CD have really only one purpose: "high energy dancefloor tracks". High bpm, less melodic, but heavy riffs and bass lines. "Melting House" and "After 2nd" predestined for the central part of our live performances. Also on this release is "Atomic Baby", our "opener" from earlier gigs. 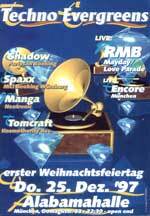 Maxi CD "LiveAct Encore - The World at your command"
I originally wrote this track as a soundtrack for the "Speed Level" in the computer game "Final Impact", but it fitted very well into our liveact style, so we played it live too. It is our fastest and toughest track, but has also beautiful trance-pads and intermediate parts. The message of "The World at Your Command" is, that if you really want it, you can control your own world by yourself, and you do not have to let someone else controlling it. This, of course, means freedom ! 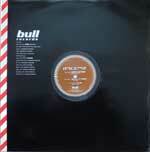 :-) The songs "Timeless" and "Moonray I + II" are also fast tracks and were produced in the earlier days. 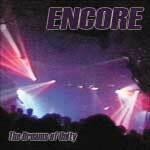 Maxi CD "LiveAct Encore - Get into your Dreams"
This record is the department "Trance" by LiveAct Encore. Less fast and hard, but beautiful and rhythmic. These tracks we have played at smaller gigs a lot !. 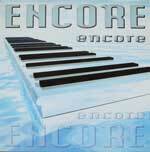 Maxi CD "LiveAct Encore - Early Experiments"
The songs on this CD are the very early experiments with this music. 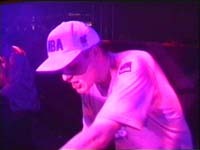 "Expressive" was written by Mike M. and is quite melodic, "I need some power" written by Noam D. is "trance" style and "Monster Phaze" is the only quite minimal techno track from LiveAct Encore. 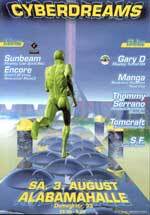 LiveAct Encore made it to the D-Trance compilation by Gary D (who was an absolute hard-trance hero !). 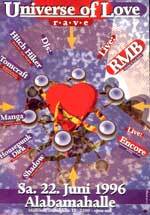 We were really proud to be on the same record with tracks like "Rodd-Y-Ler Lifesigns" etc. 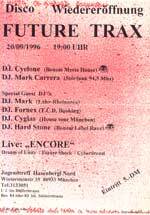 One time, when we met Gary D at the airport in Hamburg, he told us that he liked our track "Encore" very much and that this was the reason for putting it on his compilation. 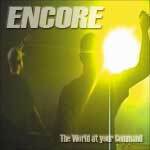 The D-Trance compilations were by far the best techno sampler at this time and for us a big honor to be on it ! 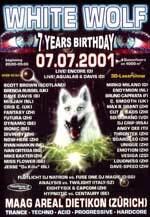 Unfortunately, I no longer have all of the flyers from the events where we have played, but what is still there, I just scanned in. 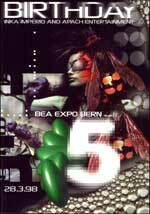 The flyers were in accordance with the techno style in this time pretty flashy and colorful, and they were distributed in masses before every big event. 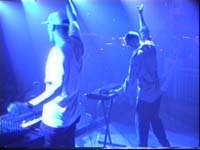 To play live in munich always was, of course, something very special, because we knew so many people in the crowd. 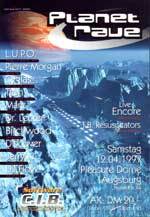 Our first gig was at the "Dream of Unity" on the legendary "old airport Riem" in front of ca 2000 people, man I was so excited ... :-). 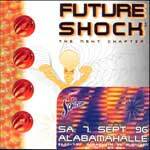 Otherwise, the "Alabama Halle" in Munich was our home base, but we also played in the famous "Pulver Turm", the Night Flight at the new airport and several smaller clubs. 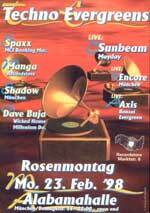 We played at many big events throughout germany. We have travelled by car, train or plane. 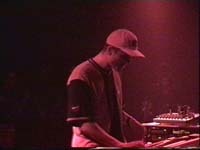 Often it was not without problems with all the live equipment :-). 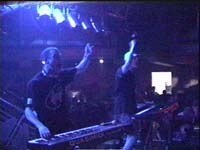 For some live gigs we even travelled abroad, mainly to Switzerland, where the people were absolutely crazy about our music :-). Also a few times in Austria and other countries.